You are probably used to keeping a record of your experimental work in either physical or electronic lab notebooks. These provide a valuable audit trail and form part of the process that makes your research reproducible. However, keeping track of ones work when developing data analysis scripts present different types of challenges from keeping track of laboratory work. When developing scripts it is often beneficial to build them up one step at a time, adding functionality as one goes along. However, as scripts become more complex one often accidentally breaks them whilst trying to add more functionality. To make things worse it can often be difficult to remember what changes were introduced since the last working state of the code. Because this is a problem that software engineers have been faced with for a long time there are now some excellent tools for dealing with it. The solution is to use a version control system. Here we will use Git, one of the most popular version control systems, to keep track of our work. In its most basic form you can think of Git as a tool for providing you with an infinite undo-button. Git is a version control system. That means that it allows you to track changes made to files over time by taking snapshots. Furthermore it allows you to view differences between snapshots and revert back to previous snapshots. In fact Git can do a lot more than this, but this is all we need to know for this chapter. We will go into more detail on the collaborative aspects of Git in the Collaborating on projects chapter. Git tracks snapshots of files in what is called a repository. You can have many Git repositories. On my computer I have a directory named projects that currently contains around fifty sub-directories representing the projects that I have been working on recently. Each one of these sub-directories is a separate Git repository. Git can track some or all of the files in a repository. The files can be located in the top level directory or in sub-directories. However, Git cannot track any files that live in parent directories of the base Git repository, e.g. none of my Git repositories can track files located in the parent projects directory. 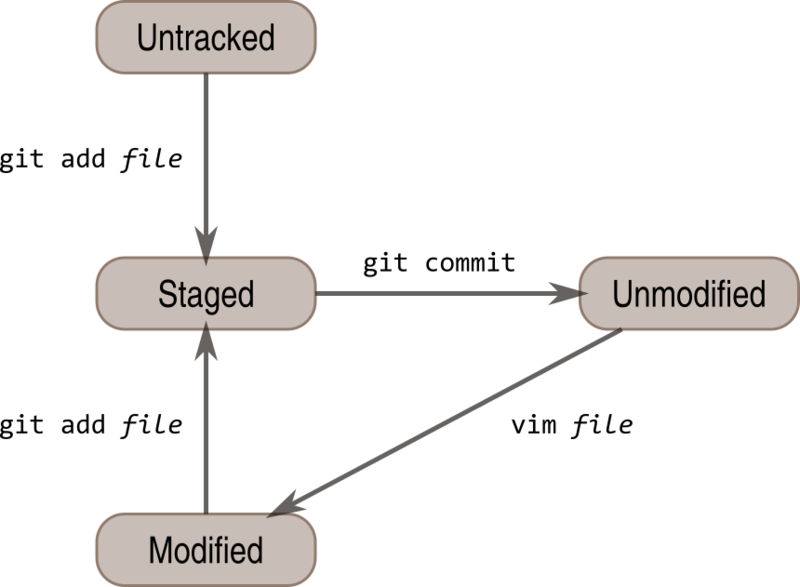 In a Git repository files can be in one of four states: untracked, staged, unmodified and modified. When a file is initially created it is in an untracked state, meaning that it is not yet under version control. To start tracking the file one adds it to Git, and the state of the file then changes to staged. This means that the file is staged to be included in the next snapshot. Multiple files can be in a staged state when one takes a snapshot. To take a snapshot one commits all the files that are in the so called “staging area”. The state of the files then changes from staged to unmodified, see figure Fig. 4. Any subsequent editing of the files under version control would result in their state changing from unmodified to modified. When one is happy with the edits made one would then add the files to the staging area and their state would change from modified to staged. At that point one is ready to take another snapshot by committing the staged edits. The state of the files then, again, change from staged to unmodified. And the cycle continues (Fig. 4). Fig. 4 Diagram illustrating the states a file can have in a Git repository. The commands git add and git commit are the key components to creating a snapshot. The vim command symbolises editing the file using the vim text editor, but any program altering the content of the file will result in the file being marked as modified by Git. Git may or may not be installed by default on your system. To find out if it is try running the command below. If Git is installed you will see output along the lines of the below. If Git is not installed you will see a command not found message. In this case you will need to install it. If you do not know how to do this you can find general instructions on how to install software in Managing your system. Although we won’t go into it in this chapter, Git is fundamentally a collaboration tool that helps people work on projects together. This means that we need to give Git some information about us for it to be able to keep track of who has done what, specifically our name and email address. $ git config --global user.name "Tjelvar Olsson"
We will look at the collaboration aspect of git in the Collaborating on projects chapter. The first thing to do is to initialise the project using the git init command. If run with no argument it will set up tracking of files in the current working directory. If given an argument, such as protein-count, git will create a new directory with this name and set up tracking of files within it. In computing the term init is often used to abbreviate the word “initialise”, i.e a one time event that results in the creation of a new entity. Use your editor of choice and create the markdown file README.md and add the content below to it. in a SwissProt FASTA file. As mentioned, files in a Git repository, the project directory, can be in one of four states: untracked, unmodified, modified and staged. To view the state one can use the command git status. The command below produces the output below. This tells us that the README.md file is untracked, in other words it is not yet under version control in Git. However, we would like to track it, so we add it to the Git repository using the git add command. Let’s see how this affected the status of the repository. This stages the README.md file to be committed. To commit the current snapshot of the project to the Git repository we use the git commit command. $ git commit -m "Added readme file." [master (root-commit) e1dc880] Added readme file. In the above the -m option allows us to specify a commit message on the command line. The commit message should describe the change that your are committing. It will be useful when you review the project at a later date. It also helps communicate your change to any collaborators working on the same project. Again, let’s see how this affected the status of the repository. That’s all you need to know to get started with Git. Start by initialising a project using git init. Then use git add and git commit iteratively to stage and commit snapshots of your project to version control. We will now convert the command we used to download the SwissProt FASTA file from First steps towards automation into a script. To add some organisation we will put this script in a directory named scripts. We will also create a directory named data for storing the downloaded file. By specifying more than one argument to the mkdir command one can create multiple directories. Using your favorite text editor enter the text below into the file scripts/get_data.bash. The only difference between this script and the command we entered on the command line is the first line #!/bin/bash. This is a special construct, called the shebang, and is used to specify the shell to use when executing the content of the file. However, in order to be able to execute the file, i.e. run it as a program, it needs to have “execute permissions”. One can view the current set of permissions of a file by using ls -l (mnemonics ls list, -l long). Note the first ten characters, the first specifies the file type and the remaining nine relate to the permissions of the file, see Fig. 5. There are three modes that can be turned on or off: read (r), write (w) and execute (x). Furthermore, these can be specified for the owner (u), group (g) and all users (a or o). The nine characters above state that the owner has read and write permissions on the file rw-, whereas both the group and all other users only have permission to read the file r--. Fig. 5 Figure illustrating how the file permissions string should be interpreted. In the above the user has read, write and execute permissions. The members of the group have read and exectue permissions. All other users only have execute permissions on the file. In this case the file type character - indicates that the file is a regular/executable file. Other file type characters include d and l which are used to represent directories and symbolic links respectively. The legend of Fig. 5 mentioned symbolic links. A symbolic link is a special type of file that points at another file. These can for example be used to create references to canonical representations of your data. 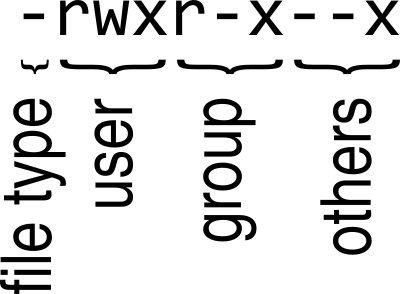 Let’s take a moment to expand on the concept of groups in Unix-like operating systems. A user can be part of several groups. However, a file can only belong to one group. For example a PhD student could be part of the groups famous-project-leader-group and awesome-institute-group. In this hypothetical scenario the default group for the PhD student is the famous-project-leader-group. Any files that the student generates would therefore be assigned the group famous-project-leader-group. If the student wanted to make a file more widely accessible throughout the institute they could change the file’s group to awesome-institute-group. Let us give the file execute permissions. This is achieved using the chmod command, mnemonic “change file modes”. The chmod command can be invoked in a number of different ways. Here we use the symbolic mode to specify that the user and the group (ug) should be given execute permissions (+x) on the scripts/get_data.bash file. Let us test the script by running it. The file was downloaded to the data directory, success! This is a good time to add the script to version control. $ git commit -m "Added script for downloading SwissProt FASTA file." [master f80731e] Added script for downloading SwissProt FASTA file. Let us check the status of our project. Git is telling us that there are files in the data directory that are currently not being tracked. However, in this project the data directory will contain files downloaded from a canonical resource and as the download script is in version control we do not need or want to track the files in this directory. It is possible to tell Git to ignore files. Using your text editor of choice create the file .gitignore and add the content below to it. On Unix-like systems dot-files, files starting with a ”.”, are treated as hidden files. These files are usually used to store configuration settings. The ~/.bashrc file, for example, is used to configure your Bash shell environment. To list hidden files use ls -a. In Bash the * symbol represents a wild card pattern that can match any string. The * symbol can be used in the same fashion in the .gitignore file. As such the line we added to our .gitignore file tells Git to ignore all files in the data directory. Git now ignores the content of the data directory and tells us that the .gitignore file is untracked. Let us add this file. $ git commit -m "Added gitignore file." However, the current setup has got an issue in terms of reproducibility. Depending on when the SwissProt FASTA file was downloaded one may obtain different results. It would therefore be useful to include the date of access in the file name. This can be achieved using the date command. The date command can be configured to create custom output formats using the + symbol followed by a string template specifying the desired format. In the below %Y, %m and %d will be replaced by the year, month and day respectively. To get the output of the date command into the file name one can use Bash’s concept of command substitution. Command substitution makes it possible to evaluate the result of a command within a string. To see this in action we can use the echo command, which simply prints out the string that it is given. $ echo "Today it is $(date +'%d')th"
It is time to introduce the concept of a variable. A variable is basically a means of storing a piece of information using a descriptive name. In bash one can assign a variable using the equals character (=). Below we create a variable named PRIBNOV_BOX and assign it the value TATAAT. The value of the variable can then be accessed by prefixing the variable name with the dollar character ($). The use of variables is a key concept in programming. It allows programmers to avoid having to repeat themselves. This is important as repetition increases the chances of introducing errors. Suppose, for example that you had a scaling factor of 1.35611 that you used at ten different places in your script. That presents ten opportunities for typing in the wrong number. Further, suppose that you, later on, needed to change the scaling factor. That presents ten opportunities for forgetting to update a value and another ten opportunities for mistyping the value. In this case it would have been better to create a variable named scaling_factor and use that variable in the ten places in your script. That way they are guaranteed to be the same value and you only need to edit one line if you need to change the value. In programming avoiding repetition is important enough to warrant it’s own acronym DRY (Don’t Repeat Yourself). We now have all the information we need to improve the script. Edit the script/get_data.bash file to look like the below. Let’s try running the script. Now we can check that the script has produced an appropriately named file. We have added a piece of functionality and have tested that it works as expected. This is a good time to commit our changes to Git. However, before we do that let us examine the changes to the project since the last commit using the git diff command. The command above tells us that one line has been removed, the one prefixed by a minus sign, and that two lines have been added, the ones prefixed by a plus sign. In fact we have modified one line and added one, but the effect is the same. Let us now add and commit the changes to Git. We need to do this as working with Git is a cyclical process. You make changes by editing the files, you add the changes that you want to snapshot to the staging area, then you commit the staged changes. At this point the cycle starts all over again Fig. 4. $ git commit -m "Updated download script to include date in file name." [master 7512894] Updated download script to include date in file name. By adding the date of download to the file name reproducibility is improved and it means that we can download the file on different dates and ensure that no data is overwritten. However, it is still possible to accidentally delete or modify the data file. To overcome this, and further improve reproducibility, it is good practise to give the data file read-only permissions. This means that the file cannot be modified or deleted, only read. To do this we will make use of the chmod command. In this instance we will make use of an absolute mode. Absolute modes encode the permissions using the numbers 1, 2 and 4 that represent execute, write and read modes respectively. These numbers can be combined to create any permission, for example 7 represents read, write and execute permissions and 5 represents read and execute permissions. To set the permissions for the owner, group and all other users one simply uses three such numbers. For example to give the owner read and write permissions and the group and all other users read-only permissions one would use the absolute mode 644. In this instance we want to set the file to read-only for the owner, group and all other users so we will use the absolute mode 444. If you run the script now you will see that it changes the permissions of the downloaded file. If you run the script again, on the same day, you will notice that the it complains that it has not got permissions to write to the file. This is expected as the curl command is wanting to overwrite the existing read-only file. Let’s add these changes to the staging area. It is good practise to try to make the commit message no more than 50 characters long. Sometimes this is not enough. In these cases you can create a multi line commit message using a text editor (likely to be vim by default) by omitting the -m flag. This should open a text editor with the text below. Use your text editor to edit this message to the below. modification of the raw data file. When you save the file you should see the output below in the terminal. Help! I’m stuck in Vim. If you tried out the git commit command you may depeding on the configuration of your computer get thrown into Vim. If you don’t know how to use Vim, it can be tricky just to get out of it. Press the Esc key. This ensure that you are in “normal” mode. Press the colon (:) key. This puts you in “command-line” mode. Enter the text q!. This is the command to quit (q) without saving (!). Press the Enter key. This executes the command from step 3. What if I want to edit or delete a file that is read only? Now that we have a script for downloading the SwissProt FASTA file let us convert what we learnt in First steps towards automation into a script for counting the number of proteins for a particular species. Add the lines below to the file scripts/protein_count.bash. Make the file executable and test the script. At the moment the path to the data file and the species are hard coded into the script. It would be nice if we could turn these two parameters into command line arguments. We can do this using the special variables $1 and $2 that represent the first and second command line arguments, respectively. Bash makes a distinction between single and double quotes. To expand variables one needs to use double quotes. If not one will get the literal value of the string within the single quotes. For example, the command echo 'Species: $SPECIES' would print the literal string Species: $SPECIES. This is a good point to test if things are working as expected. $ ./scripts/protein_count.bash data/uniprot_sprot.2015-11-26.fasta.gz "Homo sapiens"
Success! Let us add and commit the script to Git. $ git commit -m "Added script for counting the numbers of proteins." [master b9de9bc] Added script for counting the numbers of proteins. We’ve covered a lot of ground in this chapter. Can you remember everything that we did and the motivation behind each individual step? If not, that is okay, we can use Git to remind us using the git log command. b9de9bc Added script for counting the numbers of proteins. a672257 Added command to set permissions of data file to read only. 7512894 Updated download script to include date in file name. f80731e Added script for downloading SwissProt FASTA file. Added command to set permissions of data file to read only. Another useful feature of Git is that it allows us to inspect the changes between commits using the git diff command. For example to understand what changed in commit a672257 we can compare it to the previous commit 7512894. In the above we can see that we added the line chmod 444 $FNAME to the scripts/get_data.bash file. Start using Git in your day-to-day work right now!